Let’s all just admit that the best part of Passover is Matzo Ball Soup! Now, if you’re like me and you can’t eat eggs, or if you just choose to eat a vegan diet, then you are likely missing this staple for your Passover Seder. 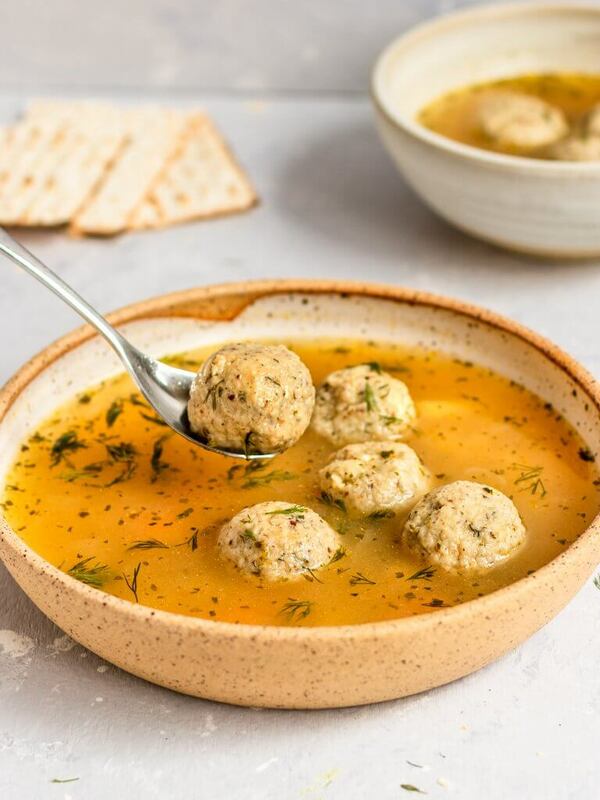 Well, I am here to tell you that you don’t have to miss out on the best course of Passover this year because this Vegan Matzo Ball Soup is just waiting to be made! Would you believe me if I told you I look forward to Passover every year? Seders can be long, you can’t eat any grain that has been soaked or given the chance to rise, and you know you have seven long days of Matzah ahead. However, from my experience, it’s also a time filled with good food, family, and some truly amazing traditions. So, why do I love Passover so much? Well, a big part is because I was born into a family of wine-lovers, great cooks, and loud singers. However, it’s also because of one very specific food. 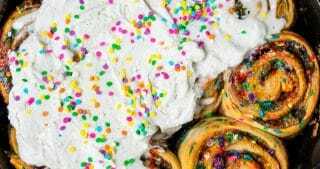 Can you guess what food that may be? Ding Ding! It’s Matzo Ball Soup! So, I did what any matzo-ball loving Jewish gal with an egg intolerance would do. I made an amazing homemade recipe for the BEST Vegan Matzo Ball Soup you have ever had. It’s pretty remarkable if you take a look at traditional Jewish cuisine and realize almost everything has eggs in it. 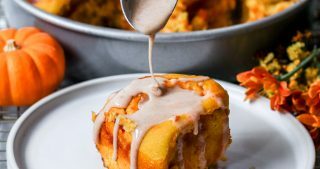 Especially the best foods like challah (Jewish bread), kugel (made with egg noodles), matzo brei ( egg and matzah scramble- don’t knock it until you’ve tried it), and of course matzo balls. That’s not even counting the meat or fish-filled dishes like brisket or gefilte fish that my family enjoys after our seder! Most of these foods I’m okay living without, but Matzo Ball soup is NOT one of them. Traditionally, Matzo Ball Soup is made in a chicken soup broth. Also, the matzo balls are traditionally made out of matzah, eggs, water, and oil. I’ve been vegetarian for a long while now, so making a matzo ball soup with a vegetable broth base has been the norm the last few years. However, for this recipe, I had to go one step further and get really creative to make fluffy and delicious vegan matzo ball without eggs. I did a few recipe tests which consisted of a lot of yummy soups with some really broken apart matzo ball bits floating in them. Not exactly bringing back those fond Passover memories! The key to this recipe turned out to be leaving the matzo balls in the fridge overnight. I don’t scientifically know why this made such a huge difference, but if I had to guess, this extra time in the fridge likely allows the flax seeds time to bind all the ingredients together and soak up any liquids. Also, I make my matzo balls extra tasty by adding dried parsley and fresh fill directly into the matzo balls themselves for the best flavor. After that, all it took was coming up with a delicious savory broth to complete this recipe. While I’ve seen this soup made with carrots and onions many times, I was inspired to try something new and add parsnips to my soup. The combination of parsnips and dill bring out the most comforting flavors in this broth. Seriously, the flavors in this soup truly bring back the best memories of the matzo ball soup I ate growing up. If you are going to try anything new this year, let it be parsnips in your soup! Cooking Jewish cuisine brings me so much joy and I am so happy I still get to eat my favorite soup at every Seder to come. Please note, if you do not eat Kitniyot over Passover, this recipe would not be Kosher for Passover as it contains tofu/soybeans and flaxseed. My family personally still eats Kitniyot so this recipe works really well for us. Even if you aren’t vegan or Jewish, I highly recommend this soup as the ultimate comfort food throughout the whole year. 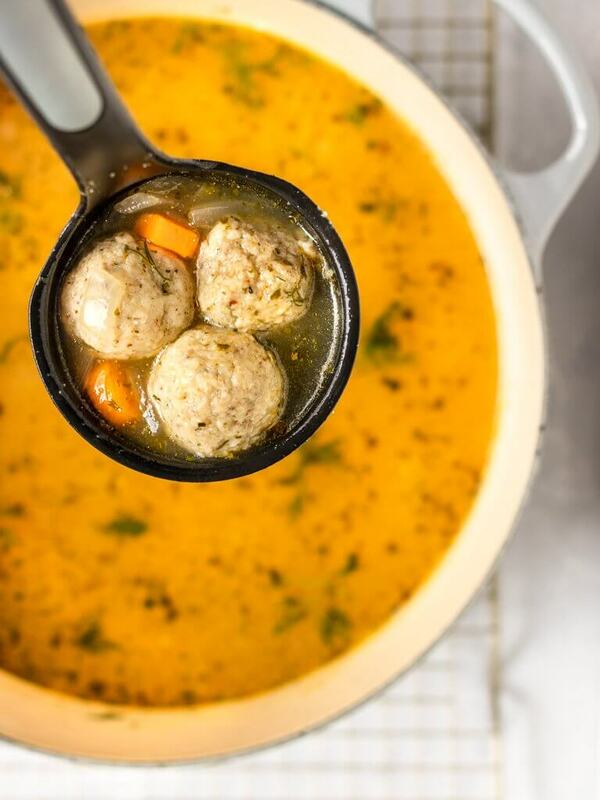 Happy Pesach to all who celebrate and hope you enjoy this Vegan Matzo Ball Soup! 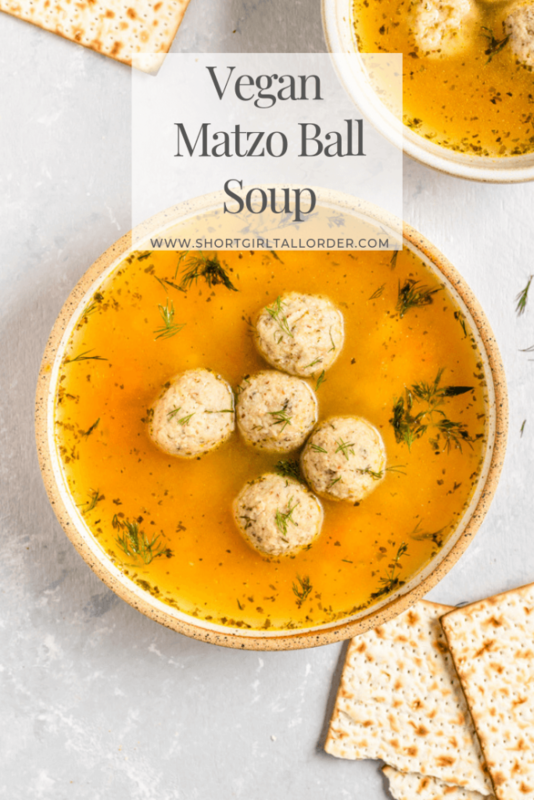 If you’ve never tried matzo ball soup before, my go-to matzo meal is always Manischewitz brand! I actually have an easier time finding this online than in many stores. Spectrum Organics Ground Flaxseed is one of my favorites and is perfect to make the flax eggs that hold the matzo balls together! Please note: You will need to make your matzah balls 18-24 hours ahead of cooking your soup. Begin by adding your silken tofu to a blender and blend until it is smooth and creamy. Next, add in your matzah meal, flax egg, oil, salt, pepper, and dried parsley. Blend until combined. Start with 1/2 cup matzah meal and add up to 3/4 to make into a firm, yet slightly sticky, dough. Lastly, add in your fresh dill and blend about 10-15 seconds. At this time, you have your matzah meal! Place in the fridge for 30 minutes to help firm before shaping into balls. Once the matzah meal has firmed remove from the fridge and form into balls. The dough should be enough for 14-16 small matzah balls total. Once the balls are formed, place on a plate, cover, and put in the fridge for 18-24 hours before making your soup. Start by adding 1 Tbsp oil to a large soup pot. Once hot, add in your chopped onions, parsnips, and carrots. Season with salt & pepper and saute for 5 minutes. Next, add your 8 cups of broth to the pot along with the soup seasoning including dried parsley, garlic powder, and additional salt and pepper to taste. Bring to a boil. 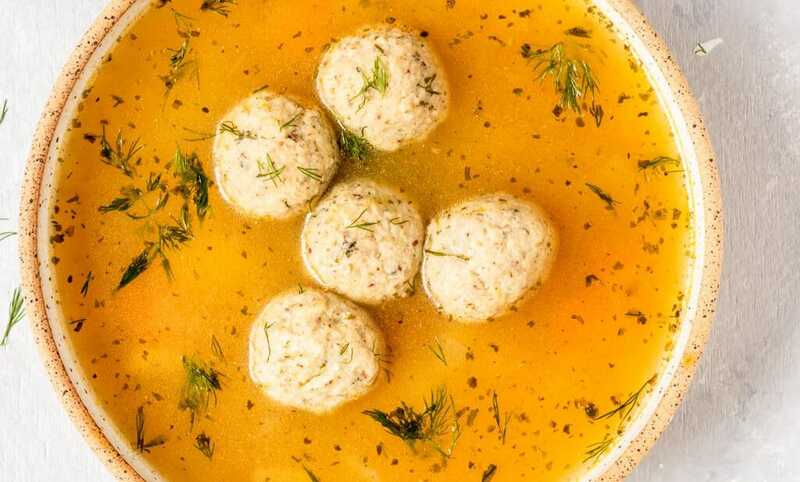 Once boiling, add in your matzah balls one at a time. Turn the temperature down to medium heat and cook the soup for an additional 8-10 minutes (no longer, you don't want to overcook everything!). Turn off the stove, remove the pot from the heat, and serve immediately! 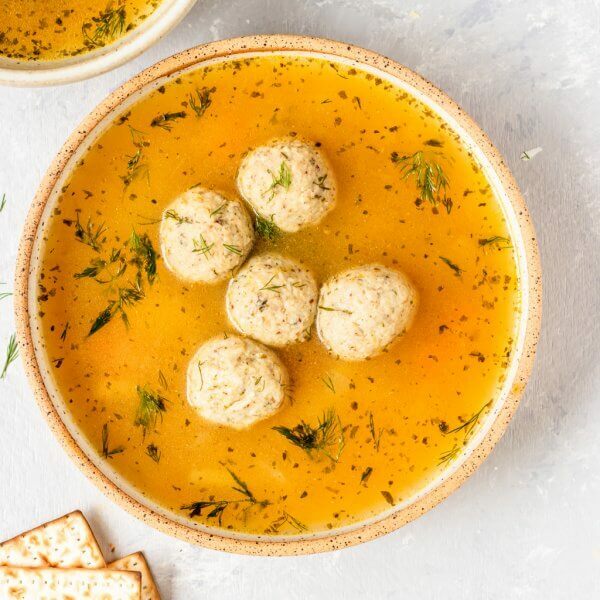 If you are storing your soup as leftovers, make sure to store the matzo balls separately from the soup broth so they do not dissolve. Of course, Jews of Ashekenazi descent, who eat no kitniyos (aka kitniyot, aka legumes and rice) over Passover won’t find this recipe KFP. Thanks Rivka, that is absolutely true as this recipe contains tofu (soy/legumes). 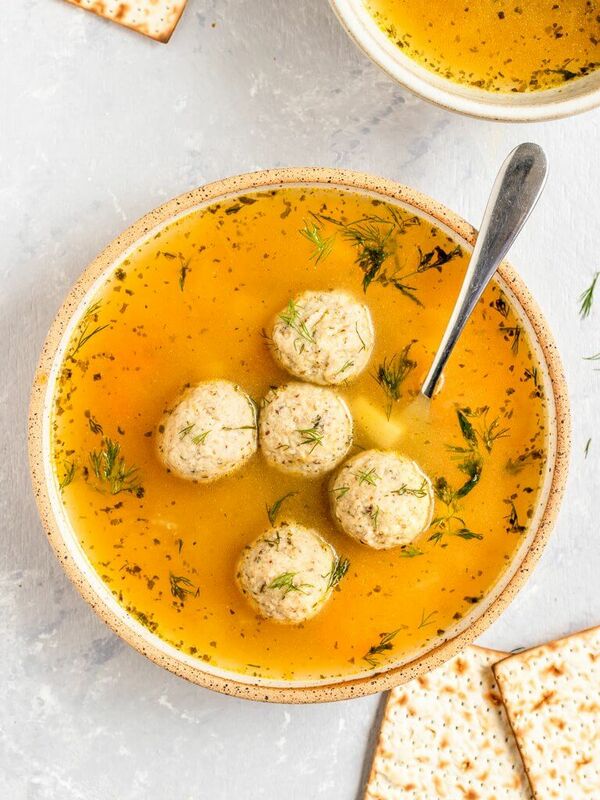 However, hopefully it will be a good recipe to try at other times of the year if you are looking for a vegan matzo ball soup outside of Passover! I have a lot of leftover firm tofu. Could I use it in place of the silken tofu? Hi there! You might be able to get away with soft tofu, however, I don’t think firm tofu would work for this recipe. I think it may make the matzo balls too dense, but if you try it let me know!